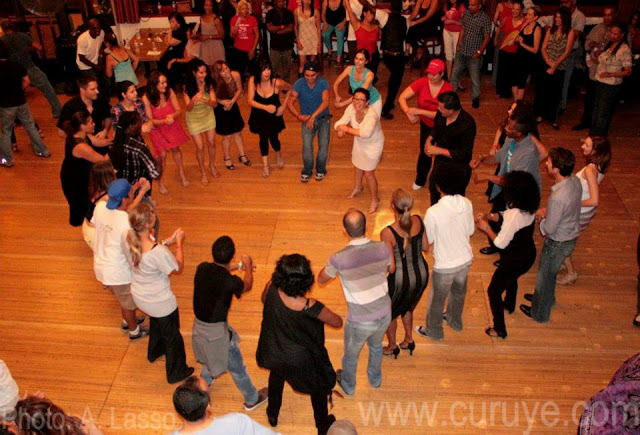 San Diego's Cuban Dance Social - This is happening 1st and 3rd Saturdays every month. Doors open @ 8:30pm, animation and Cuban dance lesson @ 9:30pm with Wilfredo Guilbiac Rodriguez, Cuban rumba and social dancing all night until 1:00am. Come celebrate RITP's 13th year of bringing casino/rueda de casino to the community. Dance, eat, sing along to music and enjoy the great company of all our favorite casineros/salseros/timberos, etc. 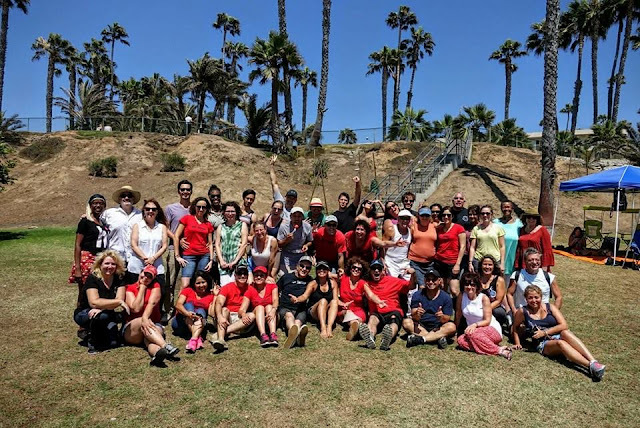 We can't take you all to cuba to celebrate Rueda in the Park's 13th Year in being, but we can bring la fiesta cubana to Santa Monica/Los Angeles. All Casineros/Salseros welcome. LADIES get ready for the annual women lead the men rueda that we do every year(la tradicion)...I hope you have been practicing..same goes for the men...time to follow. WHEN: Sunday, July 23, 2017; 11 a.m. to 5:00 p.m. o hasta no sacan(or until they kick us out)!! At 11 a.m class will be taught by Tania, which will be a refresher course of some of the moves we have done in the past. **We need side dishes (potatoes, frijoles negros, rice, yucca, salads, international dishes are great as well etc); main dishes (meats -porks, chicken, beef, etc); drinks (water, juice, soda, lemondate etc). Her is our one opportuntity to not have to drive long distances to dance to some good timba. Right here in our own backyard (a.k.a San Diego). Let support this social event by making an appearance and dancing with friends. This is happening now on 1st and 3rd Saturdays of every month - except for July. WHEN: Sat. July 22, 2017 Doors open @ 8:30pm - social dancing all night. 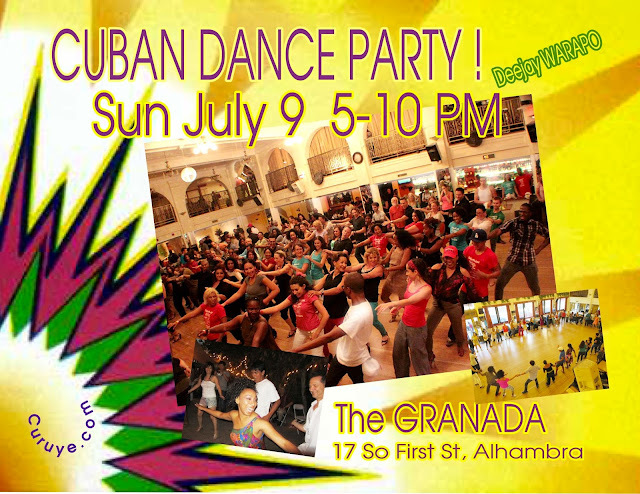 PLEASE INVITE YOUR FRIENDS AND TAG OR SHARE WITH PEOPLE THAT WANT TO EXPERIENCE CUBAN DANCE AT CLUB CUBA IN SAN DIEGO. Registration is now open for my Level 2 beginner rueda class series in Escondido. For all new dancers who are interested and habr never tried dancing Rueda de Casino (a.k.a. 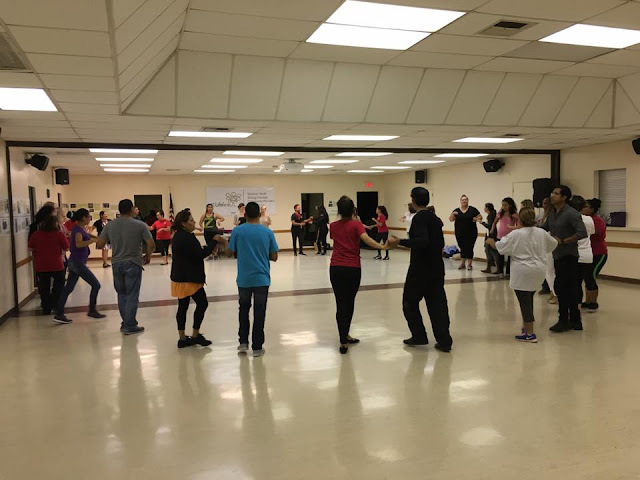 Cuban salsa in a rueda "wheel" formation), this is your chance to try it out and then consider taking the 4-week series each Monday there after through the Tierra Caliente Academy of Arts. HOW TO SIGN UP FOR Maritza's 1-Month Level 1 Beginners in August - Come to the FREE promo rueda de casino class to sign up a week before. 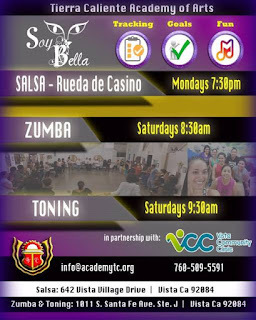 COST: Annual Membership is a one-time a year $40 fee + $25 for the Rueda de casino 1-month class. A total of $65 for Level 1, then its $25 for Level 2 , and $25 for Level 3 thereafter. Registration forms will be available a the promo class. SAVE THE DATE! We are heading to LA for the Curuye Timba dance party!! Get your dance shoes ready. Kay has asked Maritza to teach a rueda de casino class for the party. So lets caravan a bunch of people to dance with our LA amigos and casineros. If you have never been to a Curuye party before, you have to at least try it once in your life. COST: $10 per person; if you have a birthday in August, please let Maritza know so she can tell Kay to organizer to put your name on the cake. Maritza's contact is listed in the Dance Instructor's tab on this blog. Gente de Zona is going to be in San Diego next month. This is a treat to see that they will be in our neck of the desert! Ha! Don't forget to purchase your tickets!! All support acts are subject to change without notice. All ages welcome. All persons under the age of 18 must be accompanied by a parent, guardian, or by a responsible adult 25 years of age or older who has written authorization from a parent or guardian. Now that all the performances are done, we can get back to our regular routine events like Friday Rueda Practice, this is for anyone who took my class and all casinero friends who jsut want to dance and hang out. 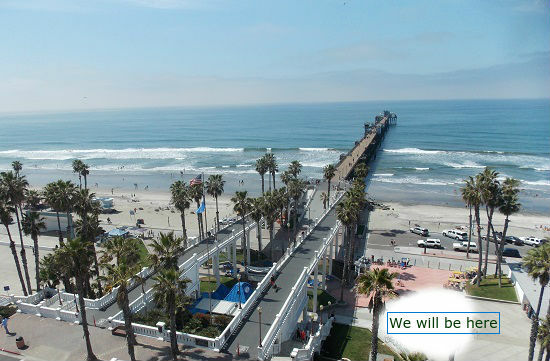 We can go get some yummy Mexican food at Colima's in Oceanside afterwards. Let's meet up with our Salsa, Mambo, Bachata, friends at the Salsa on the Beach event this Saturday. As if we didn't get enough from last weeks dance festejon in Chula Vista. I already miss you all. Some of us are going to be dancing in the San Diego Pride Parade which finishes at 3pm. 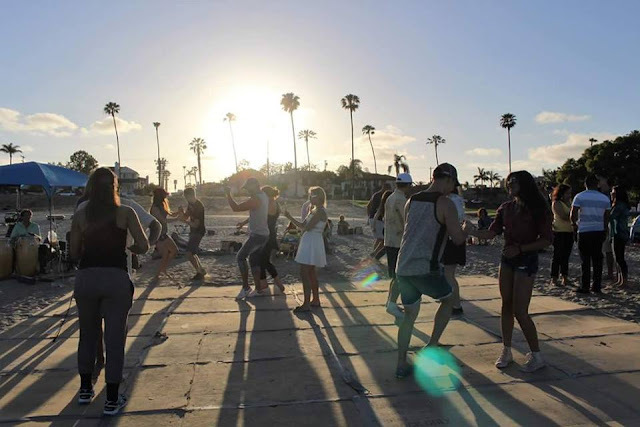 We will head over to Mission Bay to join in one the fun time dancing at the beach. If you are heading to the Salsa on the Beach event early, please bring duct tape as they are setting up a cardboard dance floor. Josh Gordon the organizer also traveled to Cuba recently and is hooked on Cuban salsa suelta and will be leading some of the suelta lines at the event. WHEN: Saturday, July 15th from 3pm to 830pm (the event goes from 1pm to 8:30pm); Maritza will arrive after 3pm. HOW TO PREPARE: Bring beach chairs, food/drinks to share as this is a potluck style event, Umbrellas, beach towels. Bring a swimsuit because it will be hot and we can cool off doing a rueda in the water. TIME TO DANCE! at CURUYE’s JULY CUBAN DANCE PARTY! SALSA! TIMBA! REGGAETÓN! RUMBA! & CARNIVAL DANCES-SANTIAGO STYLE! PREPÁRENSE! Since July is the month of Santiago de Cuba’s famous carnival, throughout the night, between dancing CASINO (Cuban salsa), RUEDAS de CASINO, and REGGAETÓN LINES, KATI will lead us in some carnival ‘conga lines’ Santiago style! DEEJAY WARAPO will keep us on the dance floor playing CUBAN SALSA! SON! TIMBA! REGGAETON! RUMBA! FESTIVITIES include the birthday dance with FREDIA REEVES, JEHAN JACKSON, JENNIE CAREY-ROSENBAUM, PAMELA ALAMEDA, PATRICIA OVANDO ! Arrive early to take KATI HERNÁNDEZ & DAMON WEBBER’s 5:15 PM RUEDA de CASINO class! Raffle tonight for drink tix and RUMBANKETE’s new cd ‘ARCO IRIS’! The Granada serves up a variety of tasty dishes from sandwiches to entrees for hungry dancers! $10 cover includes dance class. All ages welcome. The GRANADA, 17 So First Street, Alhambra 91801. FREE PARKING in structure across from The Granada.